downs: That Scarab Click Costs more than my car payments! Forget for a moment the past. Forget that Halo 1 sold over 14.5 million copies (to date), and that Halo 2 sold over 7.4 million (to date, as well). Let\'s also forget, please, what is to come: that Halo 3 has 1.5 million pre-orders (surpassing records) and that it\'s very likely to be the best selling game this year. Forget all that, and remember why you used to play tabletop games. This was essentially my dillemma sitting down at the Wizkids booth, about to be demoed on the ways of the actionclick (the singular of clix?). I had stars in my eyes from just seeing the little Halo 3 miniatures and that made me want to play Halo 3 even more urgently...if that\'s possible. My history with table top games (or clix games for this article) started with the release of Marvel Heroclix back in 2002. Later I would pick up both DC Heroclix and Indyclix (because Lobster Johnson was awesome), and my life slowly decended into anarchy. Every weekend I could be found at tournaments, and every waking moment I could be seen trying to convince my (then) girlfriend to play too. My (now) wife remembers my fanaticism much more vividly and embarrassingly than I do. Nights staying up late, sitting on my bedspread, with Destiny, Superman, Black Panther, and Wolverine (among various other clix), I do not recall, or else I have blocked it from my memory. She swears to her accuracy, and I know one thing from being married over a year: she\'s right on a frightningly consistent basis. For life to continue, my \"table topping\" needed to subside. And it did until I played Halo 3 Actionclix at PAX 07, which has essentially rebuilt my clix-enthusiasm from scratch like Chef Emerill would a flan. \"If you\'re a fan of Halo, this is the game you want,\" said the smiling Tuttle. 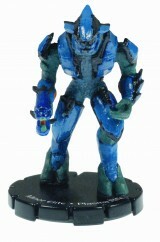 Halo 3 Actionclix Series 1 will consist of 90 characters, objects, and vehicles, although many of the same characters appear twice (in different colors). Here you will find the generic Spartan, Elite, Brute, and so on, but you\'ll also find many Master Chiefs, many Arbiters, and a few other notables, all with different poses and stats. \"We didn\'t want to have one Master Chief out there,\" said Tuttle with a conservative glance. 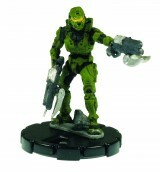 \"We give you a range of Master Chiefs holding different weapons. But there are also just Spartans, just Elites.\" There are Commons, Uncommons, Rares and Super Rares which will be greatly sought after, certainly, but the numbers of them are reduced in contrast to HeroClix. But we see this as a blessing to both our bank accounts and the fun and pace the game maintains. Games take (generally) around 25 minutes, and are much more run-and-gun based. 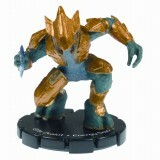 There are no \"range\" values in Halo 3 Actionclix (if you have line-of-sight, you can shoot your opponent), which has altogether elimintated the deadening frequency of ranged stand-offs which were so prevalent (and broken) in HeroClix (Damn you, Fire Lord!) Instead, strategy revolves around taking cover and occupying your opponent\'s spawn point. Gone is \"hindering terrain\". Now all cover is \"blocking\". And whoever achieves 5 kills first wins. \"Piece of cake,\" I said, but when my wife and I started playing, I found it was more subtle than shoot, shoot, shoot. Keeping with the Halo universe, Halo 3 Actionclix lets the player \"weapon swap\" on the fly, adding a very generous amount of strategy to the game. Combined with the ability to \"upgrade\" your figure in the heat of battle (on an enemy spawn point) and you have plenty of options at your disposal. \"This allows you to utilize more of your reserve than any click IP,\" said Tuttle. He was true to his word, soon we were swapping out weapons to get the upper hand in battle. Say enemies are grouped up, you can swap to a rocket launcher and do some area-affect damage, or to the energy sword and go in for the kill. And these two mechanics add a lot to the game as a whole (although we didn\'t get a chance to upgrade our men - there were none available to upgrade into). So you might be thinking: \"Why clicks? Why not a card game?\" The simple answer was that people wanted to have the figurines, or \"totems\" as Tuttle called them. \"The Clix format allows the intellectual property\'s totems,\" he said. \"We want people to say, \'I would love to have this dude on my monitor.\'\"
The figures (check out the pics) are pretty damn cool, and exquisitely detailed, right down to the miniature weapons. The dials are standard clix fare, with colored abilities that are described on the corresponding clix\'s card. These cards tell what they\'re using, what their point values are, and how and when you can use their abilities. No more futzing with sixty page manuals and rulebooks. The Halo 3 Actionclix rulebook was a single, foldout page. Slick. I can\'t forget to mention that the \"world\'s biggest miniature\", which is somewhat an oxymoron, was there as well, and will be retailing for $249.99 in November. There will also be a Hunter pack ($24.99) retailing when the game ships, and two Warthog packs. One of the packs is the actual Warthog vehicle (retailing for 19.99) and the other is a wrecked Warthog (for $24.99), both of wihch will release in October 2007, and each with their own special rules. 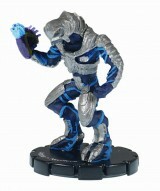 Halo 3 Actioclix will arrive in retailers to \"finish the fight\" September 19th.